Lain at Bermejo, on 40km of Samaipata; 4-6 hours walk thru the forest ; a beautiful occasion of observing a variety to birds: Tojos, parrots , zuzos, cacarenas, enjoy the look over Serranía Volcanoes and a visit to old Volcano lake with 3 different types wild ducks. Camping.cummunity surrounded by impressive pink mountains. The area offers a very large diversity in flora and fauna. Direct contact with puma, tapir and bear are not possible, however, it possible recognise tracks; bird are numerous Parrots, Tojos, Martín pescador, Zuzo, Cacarena and a lot more. streams and traditional villages, visit to the small farmer community Postrervallecito Take a coffee at Doña Valentina and Don Pancho. The water fall of 35m high in cathedral shape immense rock bowl, where hundreds of parrots have their nest. A lot of bromelias, Andes deer, iguanas,etc. About: 5 hours walk + 2-3 hours water fall. 2: Postrervalle: Excursion to the valley and visit the water fall Pajcha, traditional villages: Postrervallecito, San Juan the Rosario, Postrervalle, Tierras Nuevas, Quirusillas and Mairana. Panoramic views, microclimates, contact with local farmer population. 4 DAYS/3 NIGHTS IN THE FOOT TRACKS OF CHE GUEVARA! 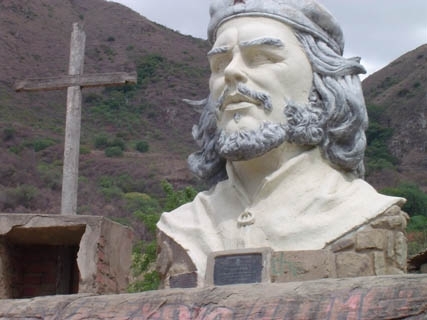 (where Che Guevara were killed)Samaipata, Trigal: enormous cactuses; Vallegrande: centre of the Vallunos: visit mausoleum, Hospital and Casa de la Cultura.Thru Pucará by to Higuera. (Vallegrande-Pucará): pilgrims area for Che Guevarra; Rio Grande: desert; passage to domestic Indian land; Nuevo Mundo;nice villa Serrano: splendid adobehouses. Villa Serrano, Tomina, Zudañez, Indians agriculture area; impressive landscapes, sociable villages streets paved with river stones; underway colonial farms. Tarabuco: coloured Sunday market people dressed in native woven clothes, most famous in Bolivia, sociable atmosphere. After the lunch we drive to Sucre. The Eastern side of the Andean mountains, panoramic landscapes, subtropical falls valleys and steep mountain slopes full bromelia´s; the rainforest of national park Amboró, very old trees with tree mosses, orchids, falcons, eagles and condors, footprints of the jaguar; perfect views from ell Fuerte – secular spiritual centre of the Amazon Chaco- and Inca-cultures; declared by UNESCO heritage of humanity; altitude varying of 1500 – 2200 m.
Herbs and flowers with panoramic view on the large green valley of Samaipata . Day 1. Arrival at the airport of Santa Cruz, transfer to hotel Asturias with English speaking guide. Day 2. In the morning visit to museum, with a guide. In the afternoon arrival i Samaipata, lodging guest house during the following 4 nights. 2 Bycar to the ruin; walking back to the river: there walk of total 2 hours, with car to the village, visit archaeological museum and city centre. Walk to the guest house. Day 4. Full day excursion to the water fall area. Pajcha-waterval. With car to Postrervallecito, farmers community , coffee at weaving place, further to village San Juan the Rosario, panoramic view , arrive at Pajcha water fall : where hundreds of parrots nest. In the afternoon departure to Postervalle: the further valley, where descendants live of sefardische Jews from the colonial time, typical agriculture area of small fall slate farmers with traditional community . Passing by Tierras Nuevas and Quirusillas,we arrive at the enormous valley of Mairana and concerning just crossing over this valley, we return to Samaipata. Day 5. day excursion national park Amboró – 1 hour go by car, 3-6 hours walk in the cloud forest with local guide with knowledge of flora & fauna + translator. This day is coordinated on the walking capacity of the visitor. 3: the volcano –massive high in the mounts above Bermejo in the middle of the red rocks of the enormous cayons. End around the afternoon arrival hotel Asturias, Santa Cruz; overnight !.